Autodesk has unveiled Maya LT 2017, the latest update to its cut-down version of Maya aimed at indie game artists, adding a new animation Time Editor, and streamlining performance and workflow. The update coincides with Siggraph 2016. As with Maya 2017, also unveiled at Siggraph, the headline feature of Maya LT 2017 is the Time Editor: a new non-destructive, clip-based, nonlinear animation editor. Any attribute that can be keyframed within Maya – including cameras and texture properties as well as characters – can be brought into the Time Editor as a clip. The Time Editor can then be used to define the timing – the speed, duration, start/stop times, and so on – of the animation; then, once the timing is finalised, the new animation can be baked for use within Maya LT.
Complex animations can be built up in layers, and there is the option to store multiple alternate versions of an animation as separate compositions. The Time Editor also includes built-in audio editing tools. 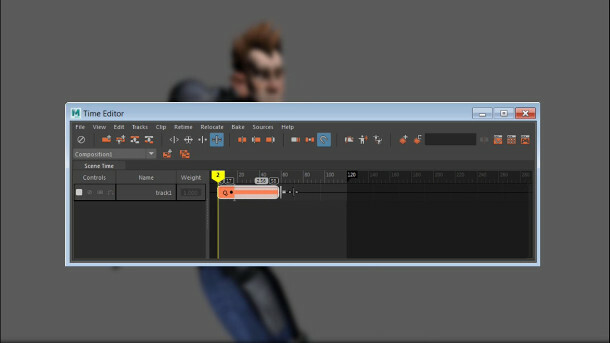 As well as keyframe animation, the editor works with motion-capture data, including multi-take FBX files. The software’s existing keyframe Graph Editor also gets a facelit, improving the visibility of animation curves through colour contrast, simplifying the stacked view, and moving the timeline to the top of the panel. Other new features in Maya LT 2017 will also be familiar from Maya 2017 itself, although they’re a much smaller subset, given that LT lacks Maya’s simulation and motion graphics tools, both of which received big updates. Of the remaining features, the biggest are probably the new Content Browser, intended to streamline the process of searching for scene assets, and the option to create and share custom Workspaces. There are a couple of smaller updates to the modelling tools, while the new blendshape Shape Editor introduced in Maya LT Extension 3 has been extended. Changes include the ability to merge multiple targets into a single blendshape, and a new Clone Target Tool to copy edits from one blendshape to another. The viewport display has been improved, adding native support for the OpenSubdiv Catmull-Clark Adaptive subdivision method in Viewport 2.0. Autodesk also estimates a speed boost of 2-4x for mesh editing when using OpenSubdiv Catmull-Clark Uniform subdivision, for which OpenCL acceleration is now available on Mac as well as Windows. Maya LT 2017 is available for Windows 7 and above and Mac OS X 10.10.5 and above. As with all of Autodesk’s software, licences of Maya LT are available on a subscription-only basis, starting at $30/month or $240/year, and including access to Autodesk’s Stingray game engine.